We Invite You To Just.... Make The Turn! On your way in to Myrtle Beach, Turn Left! On your way out, Turn Right! 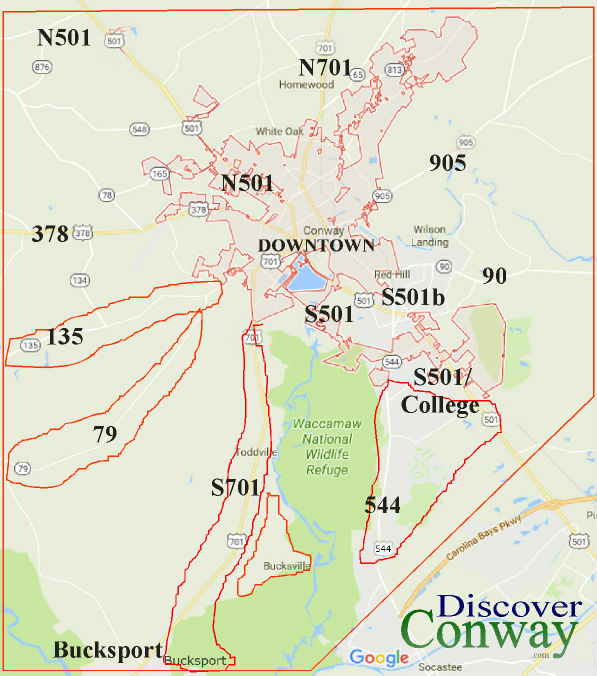 Discover Conway! It is estimated that 16+ Million people each year visit the Myrtle Beach area... Well, a good majority of those people drive to the beach and they have to drive through Conway to get there! Unfortunately, however, most of those people only know Conway as that town you have to go through on the way to Myrtle Beach... the town that you always get stuck at the traffic lights... the town that you have to go over the bridge in.... the town that is the real beginning of heavy traffic on Highway 501.... Well, those same people don't know that if they would just "Make The Turn" To The Left they would see what Conway is really all about! Yes, we will be the first to admit that the way things look on 501 when you first enter Conway doesn't look the best... some run-down buildings and properties... some traffic issues... kinda really doesn't look all that inviting... BUT, we are working on it!... AND, we want you to feel welcome to our town! 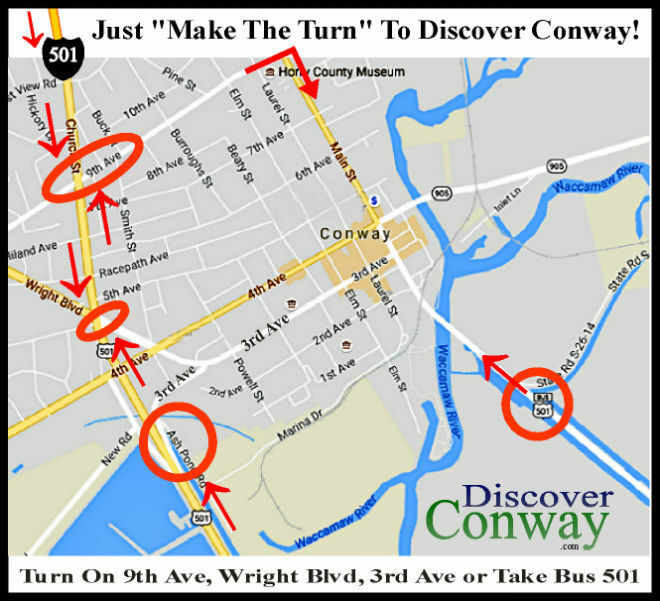 We Are Inviting You To Just "Make The Turn" to see what Conway is really all about! Either Way, Please Come Discover Conway! You will be able to experience life at a much slower pace... get out of your car and stretch your legs!... 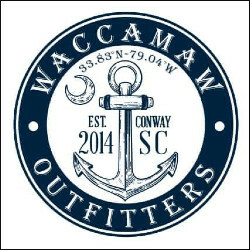 Come see Hundred+ Year Old Oak Trees, Beautiful Historic Homes, Run Across Some of the Friendliest People in The South, Shop at Small Local Businesses, Eat at Unique Restaurants, and see some of the majestic Waccamaw River as you stroll our Riverwalk and Riverfront Park area! Our Wonderful Historic Rivertown! You can even rent a pontoon boat or a kayak and spend some time on the river if you would like! Yes, the ocean and sand is beautiful, and we certainly love it and visit it too, but come do something different for a change and take a break with us! We have a lot for you too! A lot to Learn and Discover if you will just "Make The Turn!" CAPTURE YOUR VISIT WITH US! WHAT'S GOING ON IN CONWAY? Save Money On Your Visit With Us! Copyright &COPY 2016 - Discover Conway DiscoverConway.com its partners and licensors. All Rights Reserved. Discover Our Wonderful Historic Rivertown City - Conway, South Carolina!